Remotely View Your Home with Our Smartphone App! Security Specialists can integrate your cameras with your security system for the ultimate peace of mind. Watch live, streaming video on multiple cameras at one time, and receive video clips and images of events occurring in and around your home on your laptop, smartphone or any compatible mobile device! Our cameras are portable and can conveniently be placed anywhere around your home. The solution is ideal for monitoring your kids when they get home from school, checking on your teenagers from dinner with your wife at the local restaurant, or if you simply want to keep an eye on your pets from work. It is as simple as selecting our App from your smartphone or mobile device or logging into your account on your computer. 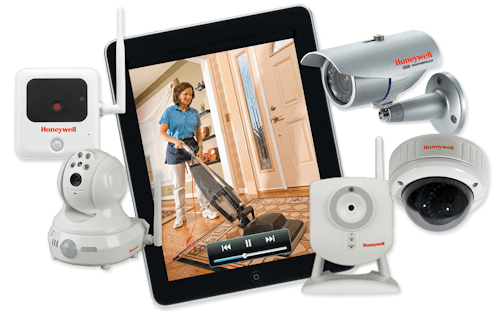 Why Choose Video Surveillance for your Home? In a world of uncertainty, protecting what’s most valuable to you has now become paramount. Keeping your home and family safe is critical for peace of mind. The need for you to protect invaluable assets like your family, property, and belongings have become a way of life. Loss Prevention is now an everyday way of how we think and act at home or in business. Our residential video surveillance system enables you to actively monitor your home right from your smartphone or from your computer at work. We are a market leader in advanced security products & solutions for residential applications. Our company’s reputation is built on dedication to uncompromising product quality with best-in-class installation & technical expertise, quality solutions and reliable after sales service and support. We pride ourselves on delivering outstanding customer service with technical expertise across the full range of our home security and business security solutions.